Product prices and availability are accurate as of 2019-04-10 15:36:33 EDT and are subject to change. Any price and availability information displayed on http://www.amazon.com/ at the time of purchase will apply to the purchase of this product. It's never been easier to print on your crafting projects or home design items. 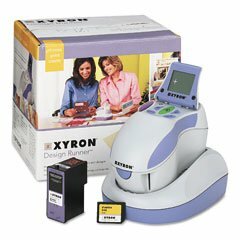 Take the printer to the project with the handy, lightweight , portable Xyron Design Runner. With the use of interchangeable design discs you can literally print thousands of images, words and borders practically anywhere your imagination takes you. This handy little crafting wonder will even print on wood or fabric. Digital display screen lets you see exactly what you are printing. Comes complete with printer, dock, one black print cartridge, one starter disc with 40 designs, two 9V batteries, user manual and idea book. 2 year limited warranty. Ink cartridges also available in red and green.